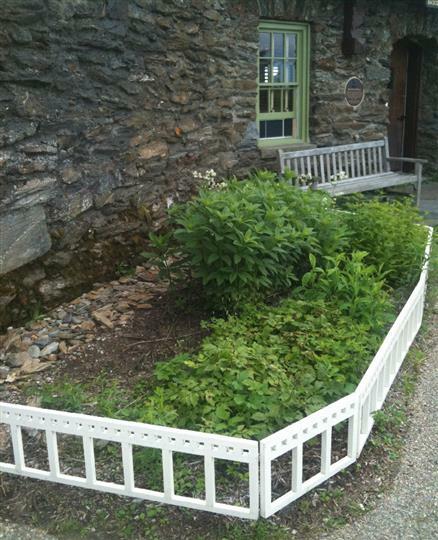 PART OF OUR PROPOSAL FOR THE MANAGEMENT OF BASCOM LODGE WAS A DESIGN FOR THE ESTABLISHMENT OF A NATIVE PLANT GARDEN. IN THE SPRING OF 2011 GROUND WAS BROKEN ON THE CONSTRUCTION OF THAT GARDEN. 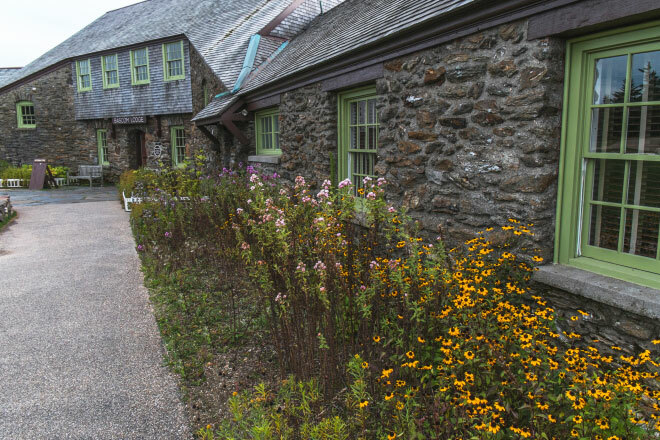 THE VARIOUS CONDITIONS OF SOIL, DRAINAGE, AND ASPECTS OF LIGHT ALONG THE FOUNDATION AT THE FRONT OF THE LODGE ALLOWED FOR A DIVERSE COLLECTION OF NATIVE PLANTS. UNDER GUIDELINES SET DOWN BY THE NATURAL HERITAGE & ENDANGERED SPECIES PROGRAM, THE GARDEN COULD ONLY CONTAIN PLANTS THAT ARE NOT ONLY NATIVE TO THE RESERVATION, BUT GENETICALLY IDENTICAL TO SPECIES GROWING HERE. NO PLANTS COULD BE ACQUIRED FROM OUTSIDE SOURCES, NOT EVEN NURSERIES SPECIALIZING IN NATIVE PLANTS. THEREFORE, THE PLANTS IN THE GARDEN AT BASCOM LODGE ARE GROWN FROM SEED COLLECTED WITHIN THE RESERVATION, TAKEN FROM CUTTINGS, OR DIVISIONS OF PLANTS ACTUALLY GROWING HERE. BY DEFINITION, THE PROCESS IS SLOW, METICULOUS AND LABOR INTENSIVE. * TO VISUALLY ANCHOR THE LODGE WITHIN ITS NATURAL SETTING. IN THE WILD DUE TO HABITAT LOSS AND HUMAN DEVELOPMENT. * TO HELP INCREASE ONCE FLOURISHING NATIVE SPECIES.